Cheers! 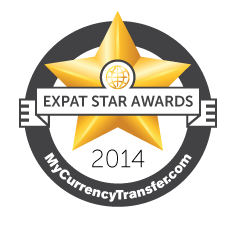 Welcome to the 2014 Expat Star Awards, sponsored by MyCurrencyTransfer.com. 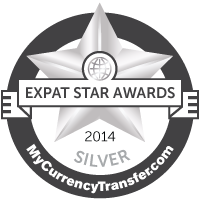 Our ‘Top 10 Websites & Blogs For Expats in the United Kingdom’ award, recognizes, rewards and celebrates sites of excellence that share tips and stories for expats living in the UK. From stories on how to navigate through the tub, to learning how to navigate through new government requirements unknown to foreigners, these sites have it all. Huge congratulations to Jacintha Verdegaal for her fabulous blog about city life in London and many other cities around the world. The thing we love about urbanpixxels.com is that the stories are told largely with pictures. They say a picture says a thousand words and urbanpixxels.com is no exception. 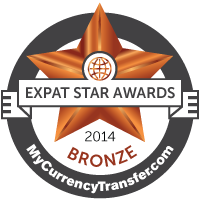 Just take a look at the expat section to see what we mean. The “One Year In London” entry has to be our favourite and is a beautiful collage of London life seen through the lens of an SLR camera. Once you see the quality of these images, your smartphone camera will immediately lose some of its shine. Stunning visuals, fabulous stories and topics you actually want to read about make urbanpixxels.com a worthy winner of our UK category. Well done, Jacintha! Our second place goes to Muriel Demarcus for frenchyummymummy.com. Muriel always wanted to write and she is extremely good at it. She left the corporate life back in 2011 to spend more time with her children and set up her own business. Years ago, one of her French teachers laughed in her face when she told him she wanted to be a writer. Guess who’s having the last laugh now? This French yummy mummy living in London writes all about the differences between Great Britain and France. She writes about British food, bringing up bilingual children and how the gap is growing between her and her home country. We think you should send a copy of your award to your French teacher, Muriel! Well done. Head on over to the Expat Life section on tntmagazine.com and it’s clear to see why this informative and fresh website made it to third place. From advice about visas to opening a bank account, TNT takes you through these processes with confidence and authority. The best thing about TNT is that most of the people behind the scenes have been in your shoes. Hailing from New Zealand, South Africa and Australia, they have been immersed deep in the expat experience for years and can tell you a thing or two that will ensure your transition goes as smoothly as possible. Smitten By Britain’s author Melissa has labeled herself a Britophile and writes often about her strong love for all things related to Great Britain. If you’re looking to learn the history of Great Britain, learn more about the Royal Family, or perhaps the local food and culture, Melissa really tells it all. Melissa’s sense of humor shines through her writing and readers really get to feel what it’s like to be a Brit! There is even a place to read about all ‘weird’ things that Great Britain has to offer, the funny things you don’t often speak about. FOCUS, is crammed to a bursting point with information for expats in the UK. Most of the material is written by expats for expats and so you can be sure that the tips you are reading have been shared by somebody who has been there, done that and bought the “I Love London” t-shirt. Whether you are based in London or elsewhere in the UK, FOCUS will give you lots of first hand advice for living here and can also tailor information to your specific needs. Whether you have lived in London for a while or are thinking about making the move, girlinlondon.com is a great resource. Cheylene, the host of this fascinating blog, hails from the USA and had a fairly rocky road getting where she is today. Her story is one that will inspire and intrigue anybody who thinks they can’t fulfill their dream of moving to another country and changing their life. As the title of this blog suggests, it is written by an American living in London. Lots of those around, you might be thinking, but this is an expat blog with a difference. 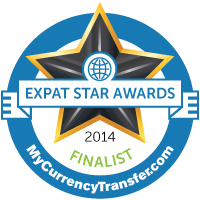 Here you’ll find lots of expat advice for sure, but you’ll also find some fascinating stories told with great energy and passion. We especially liked the recent post entitled “Some thoughts on soccer, ‘The Beautiful Game’” – a great post following a fantastic performance by USA in this year’s World Cup. Living in a foreign land and want to know how you can look your best for less? Let britishette.com show you the way to chicness. Here you’ll find out how to raid the second hand stores and find the best fashions on a shoestring. Whether you are on a pauper’s salary or you simply want to stand out from the crowd, you’ll find some great style tips here. Oh, and you’ll also find some great advice on travel and UK living. Expatica UK has everything an expat could possibly need for their transition to the UK. Information is laid out in a very user-friendly way and you’ll find everything here from relocating your pets to finding things to do with your free time. There is also a great forum with lots of members asking and answering a wide range of questions on expat life – some of which you may have yourself. UK Yankee was first opened up to viewers way back in 1999. The founder wanted answers to her many expat questions, but couldn’t find anything that came close to delivering. So, she started a blog herself. UK Yankee now has tens of thousands of visitors every month which is probably down to its friendly community, handy conversion tools and fascinating posts.